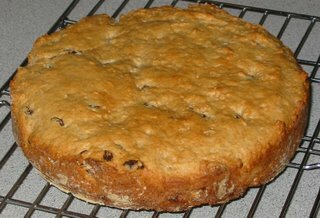 Tahinopita is Greek tahini cake -- a dense cake studded with raisins and nuts that tastes something like an enormous raisin cookie. It is "strict fasting" or "Lenten", meaning it contains no dairy, eggs, or oil and is suitable for "fasting" days in the Orthodox church. Preheat oven to 350º. Spray an 8-inch round springform pan (or cake pan) with nonstick spray and dust with flour. Set aside. Sift together the flour, baking powder, salt, and cinnamon and set aside. Place the tahini in a large mixing bowl and slowly drizzle in the orange juice while beating with an electric beater. Add the sugar and beat well for several minutes, until smooth and lighter in color. Add the dry ingredients and mix well. The dough will be thick like cookie dough, so stop if your beaters get bogged down. Knead in the raisins and walnuts. Press the dough into the prepared pan, using a spatula or slightly moistened fingers to press the dough into place and smooth out the top. Bake for 35 to 38 minutes, until golden brown on top. 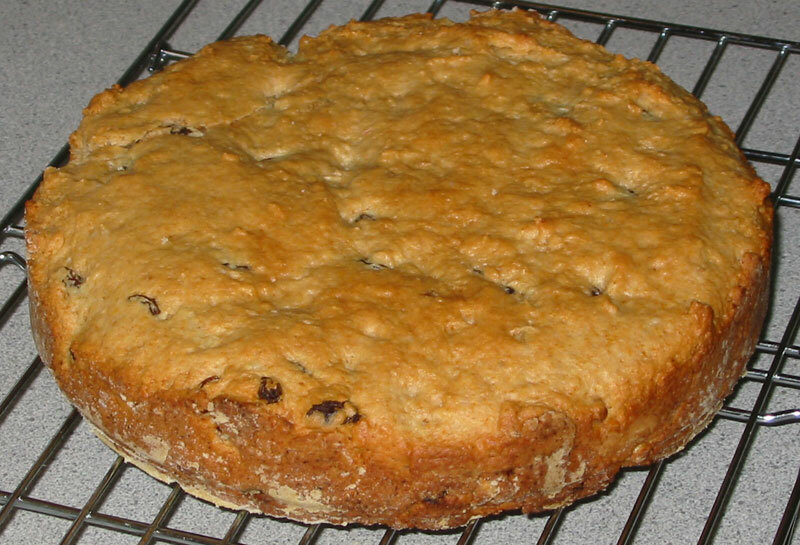 Let the cake rest in the pan for several minutes, then remove from the pan and cool on a wire rack. Boil the sugar and water together in a small saucepan for about 10 minutes to form a slightly thick sugar syrup. Drizzle the syrup liberally over the top of the cake and brush on the sides. This looks fantastic! I can't wait to try it. Thank you. Whew, I'm so relieved. I read the salt quantity as 3 1/4 tsp, and I was flabbergasted! Never mind. :-) Can't wait to try this. Thanks so much for this great recipe. I rushed to the health store and made used this recipe to make 'mikro' Tahinopita, in a muffin form. I expected something cake like, but these turned out a bit like healthy, slightly sweet bread muffins. I made the unglazed version, so maybe that explains. Next time I'll use a bit more Tahini, because I didn't really notice the flavour, but I may have used too little of it (I still have problems with these US measurements :-) Amsterdam guy here). Easy to make and delicious! Thank you for all your wonderful recipes and lunch box pics. I will definitely try baking a Tahinopita. Glad you're feeling better. just a bit of a conversion. I got an email from a friend with a link to this post. I went out to a couple stores to pick up some items yesterday and made a batch last night. I brought it over to her house and three of us ate about two-thirds of the loaf in probably 30 minutes! I did not made the syrup for the top and it was just the right sweetness. Usually I boil raisins before adding them to a bread recipe, but I did not for these and they turned out very soft! How do you roast tahini? I have some, but it's like a thick liquid (maybe like a milkshake or just a bit thicker)? The stuff you described, annmarie, is exactly what tahini is upposed to look like. It should be fine, it just won't taste quite the same as roasted. I can't wait to try this recipe...it looks like a great way to use up all the tahini in my fridge, and I can never get enough of Greek desserts - thanks, Jennifer! I thought tahini was made from sesame seeds. The kind I have in the fridge is that kind. Another poster said it was from soy beans. Now I'm just confused. I'd like to make this for my vegan BF. I think he'll really like it but i'm a bit worried the tahini will make it taste bitter. Just curious, i'm a new vegan, i love your blogs, i bought the ingredients for this today and was wondering do you keep tahini refridgerated? I didn't want to open the jar until i knew, hehe... thanks! I think this user made a typo, because obviously tahini is made of sesame seeds, not soy beans. In my health food store there are two kinds. Dark and white tahini. The latter is more expensive and made of hulled seeds. I think all the avilable products here are the roasted type. 1: Out of tahini, blended sesame seeds and a teaspoon of olive oil instead and put in the cake. 2: out of walnuts, used almonds. 3: Added 2-3 tbs of dried coconut. YuuMMM! This is like the best thing I've had in a while. Thanks! Yep, tahini should be refrigerated once opened. I used cranberries instead of raisins and used only 1/2 cup tahini and 1/4 cup applesauce (b/c I did not have enough tahini)...but it turned out delicious and we could still taste the tahini. I made it tonight for breakfast tomorrow but my husband and I both had to have a slice before bed. Thanks for the recipe! Thanks for the great recipe!!! As soon as there is more than me and the 3 cats living at home I'll be making one of these. Husband still working and knitting out of town, son gets home from college on the 9th. See you at Friday Night Knit Night!! Just wanted to write and let you know how much I LOVE your site! Your recipes look amazing- I bake the fluffy white cupcakes all the time for friends and family and they are always a big hit. Can't wait for your cookbook! Thanks so much for sharing everything you share with us! How many muffins did this make? I'm guessing 12, but wanted to doublecheck. Also, how long did you bake your muffins? Hey Cuz! This is the first of your recipes that I've actually made and it turned out great! I had to do the Greek style and get that sugar syrup running all over it. WONDERFUL! Now I'll have to try some other recipes. Everything always looks so great. Hey, Zach! Glad you liked the tahini cake! Yes, I think the sugar syrup is a must. I remember helping out at the Greek festival at our church in California. All the cookies -- hundreds of them -- got dipped in giant pots of sugar syrup. Oh, and I put a large pinch of ground Chinese ginger in the sugar syrup. It gives it a nice spicy/citrus type flavor that compliments the cake well. I only boiled my sugar/water mixture for about 5 minutes and it thickened up pretty fast. Maybe it's the altitude here or the temperature of the stove...but after I poured it over the top and spread it around, it hardened up. Is it supposed to be a glaze that hardens up, or should it just sort of moisten the cake some? It still turned out great. Even Ralph liked it and he's usually VERY apprehensive about things like this. I tried this out yesterday, followed the recipe pretty much to the letter but skipped the syrup topping (my sister is a bit hypoglycemic) - and it was a HUGE hit! Four of us pretty much took care of it in the course of the afternoon... :-) I'm intrigued by the idea of trying it with pumpkin. I think that's next. Completely adored it ! Left out the syrup at the end but next time, will brush top with agave nectar, for looks, mostly. One Tablespoon (Tbsp) is 15 ml. (if you are taking an Australian recipe though and you see one Tbsp, that's 20 ml, don't ask why, but that's the way it is). Thanks for the recipe Jennifer!! Wow!! thank you for this - I'm Russian Orthodox and fasting can get a little boring.... this sounds great !! Thank you! This brings me back to summers spent in Greece on the island where my Grandparents keep their home half the year. To be *authentic*, the sugar syrup is necessary, but it's delicious either way. anyone try this with whole wheat flour instead of all purpose? where in the grocery tore would I find tahini, any ideas? And what does it look like... lol stupid questions I know but I really want to try this.. This is sooooo good! I used oat flour because I try not to use much regular white flour, and it still came out delicious!!! :) Great site! I know that this post comes nearly a year after the original one, but just in case.. I've tried and loved something called 'tahinompoukies' (tahinibites). Can't quite classify it to either muffins or cookies. Soft, small balls, covered with ground walnut, texture a bit like truffles, but it is strict fasting, so eggs, milk and margarine are excluded. I presume it contains only flour, sugar, walnuts and tahini. Has anyone ever come across it and knows the measurements ? TIA ! Jennifer, RARELY have I had a dessert I loved as much as this. I made a few slight changes, but stuck to the recipe much more than I usually do :-) and it was INCREDIBLE! With or without sugar syrup. I made this back during lent, but there's no way I'm waiting till next spring to make it again! (Maybe my birthday this month...) Thank you from the center of my sweet tooth! Actually... I would like to post this recipe on RecipeZaar, a huge cooking site that is not vegan but there certainly are many excellant vegan recipes there. I would give you FULL credit, of course. I just think it would be great to share this with the wider community. Vegan desserts rule!! made this tonight. YUMO. used pitaschos and cranberries. omitted the salt cuz pitaschos have alot of salt. shld've baked for less time cuz mine came out kinda burnt. now that it has cooled down quite a bit, it is actually pretty damn tasty! I used dried cranberries and chopped almonds, to increase the chances that my boyfriend might eat it (he hates raisins). My tahinopita turned out tasty, definitely like a cake and not like a cookie (or bread). I think I might have underbaked it a bit - I baked it for 38 minutes, but mine was in a small loaf pan, so it was taller than yours, which is why it wasn't like a cookie at all. But it didn't feel at all mushy or doughy either, so I'm all happy about it. My boyfriend said it didn't taste much like tahini (even though I used roasted tahini), but he has never even tasted tahini. I liked the distinct but not too strong halva taste. I'll see what my dad thinks, he's a big fan of halva. I made the tahinopita this morning after looking at a few other recipes. This one used ingredients which I had on hand (minus raisins, so I subbed in chopped mediterranean apricots). This was delicious, but I recommend increasing the cinnamon to enhance the flavor. Everything blended together beautifully, the tahini was so mild, yet rich simultaneously. Oh my goodness..this was SO GOOD. The taste reminds me of Panettone, which I haven't had in forever! I absolutely loved it! Thank you for this recipe! First, let me say that your recipes are a Godsend! I haven't tried any yet, but I'm printing them as I write. They look like things my whole family would eat, vegan or not. I am also relatively new to the Orthodox Church (chrismated 2 years ago) and need recipes for fasting periods. This Lent has been a struggle as I only have a handful of vegan recipes to choose from right now. I wondered if you are also Orthodox because of your knowledge of the fasting requirements of Orthodoxy. If you are, then have a Blessed Pascha! !